It’s a beautiful thing. I wish I had splurged on it 4 years ago. It’s been a long time since you’ve seen the other house (except, you know, in the before + after section since I still haven’t gotten around to making that reflect our current life) but that doesn’t mean that we still haven’t actively been doing maintenance and improvements to it. Even though it’s our rental, no longer our primary residence, we want to make sure that it stays in good shape in the off chance that we 1) decide to sell it or 2) use it as our eventual family beach house when we win the lotto or pay it off. So far, so good, but no lotto. The driveway condition was deplorable, and it was that way when I bought it in 2009. 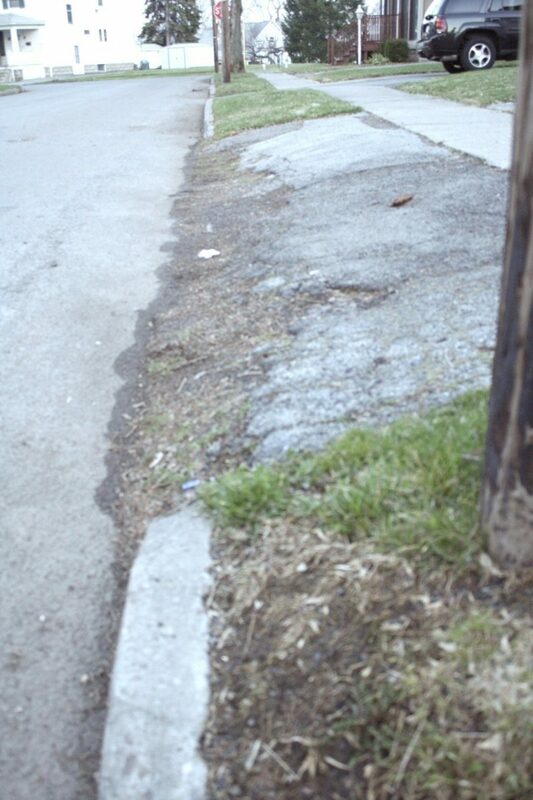 A total eyesore and probably/easily/definitely the worst of the driveways in the neighborhood. It’s kind of a shame in hindsight that we didn’t have the driveway reconstructed years ago (even though I had the money sitting aside for this huge job, I had always been holding out hope that the City would make its promised repairs to the street and sidewalk first so as not to disrupt my smooth, perfect asphalt). There’s no good way to explain quite how poor it was in real life, but this dark and stormy photo taken in April of 2011 tells the tale pretty well. It only got worse. 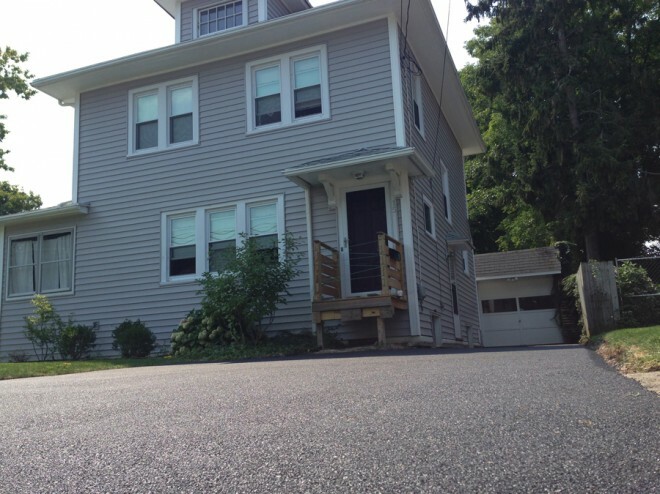 We learned a lot about the driveway itself (and the quality of prospective Rochester-area contractors themselves) in the quoting process; if you can imagine, many crews advised just patching over it again and smoothing it out. Regardless of the fact that listening to these sub-par companies and patch to save myself a whole lotta $$$, I knew that wasn’t the right course of action, it was in too poor of condition, and their lax attitude about the situation made me think they were just in it for a quick buck. A rare few companies presented the option of replacing it in full, one of those companies was Pittsford Paving; and not only did they immediately recommend a full excavation, their estimator gave me a completely different insight on the driveway within the first 3 minutes of meeting with us. 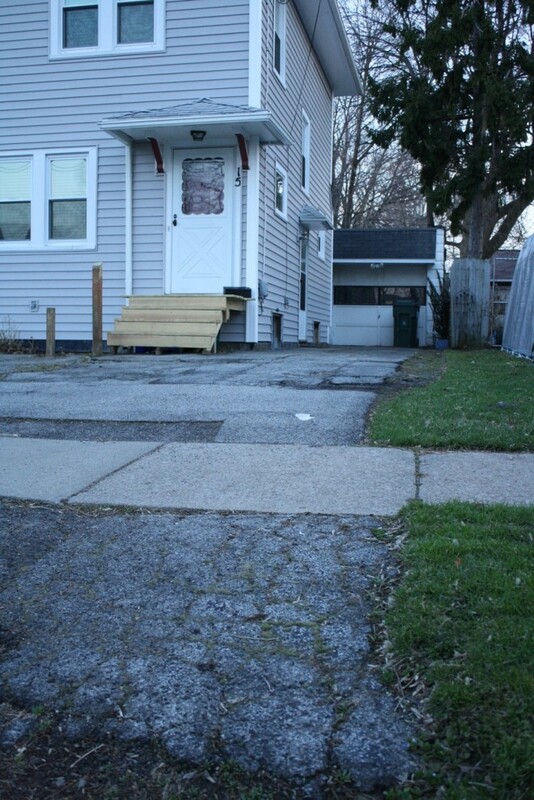 The estimator could tell by cracks in the asphalt that a cement sidewalk once ran from the street, to the front door, all around the edge of the house, beneath the eaves to the side door, and then around to the back door where our deck now sits. In years of living here, it was the first time we considered this, and of course this makes sense–we found concrete slabs in an area that the grass never grew in the backyard (we removed it and installed a small flagstone patio), and explains why we had big chunks of cement in a space beneath the deck that the dog loved to lay on. All other signs had been covered by asphalt. The driveway itself used to be two cement pathways, further evidenced by the cracking pattern in the asphalt that had simply been layered over the cement that no one ever bothered to remove. There were so many layers of asphalt applied that the driveway was substantially steeper than it needed to be. The grading wasn’t poor, but the layers attributed to a very awkward hump at the base of the driveway that, unless you were in a SUV-height vehicle, couldn’t be maneuvered without scraping. 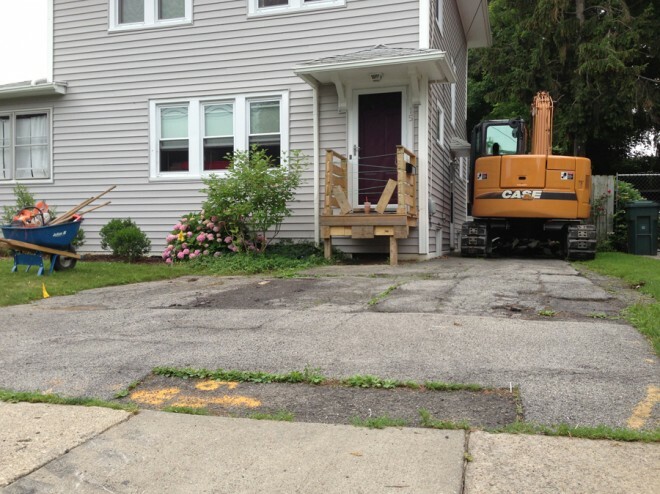 We hired them immediately, and have since spent the last three months working to make sure that this driveway was improved for our new tenants. Three months might seem a bit long for a job of this size and type, but we dealt with a few unforeseen problems (keep reading) and then simply battled the rainy summer and our personal vacation schedules to make sure the job was being done on a day that we were in town and available to responsibly oversee the project. It started with the gas company coming out to mark and flag the necessary lines; this happened in June before we even moved out of the house. It wasn’t until early July that we were able to schedule the excavation (we wanted to give ourselves enough time to move out, and the tenants enough time to move in because the front staircase needed to be removed temporarily, causing a bit of an inconvenience if you’re trying to haul in/out couches and mattresses). I almost showed up with a 6-pack and a folding chair to watch on demo day. They wouldn’t let us drive, sad face. I shouldn’t have so surprised that removing so many layers of asphalt and concrete would leave us with a much lower driveway base, but I was. 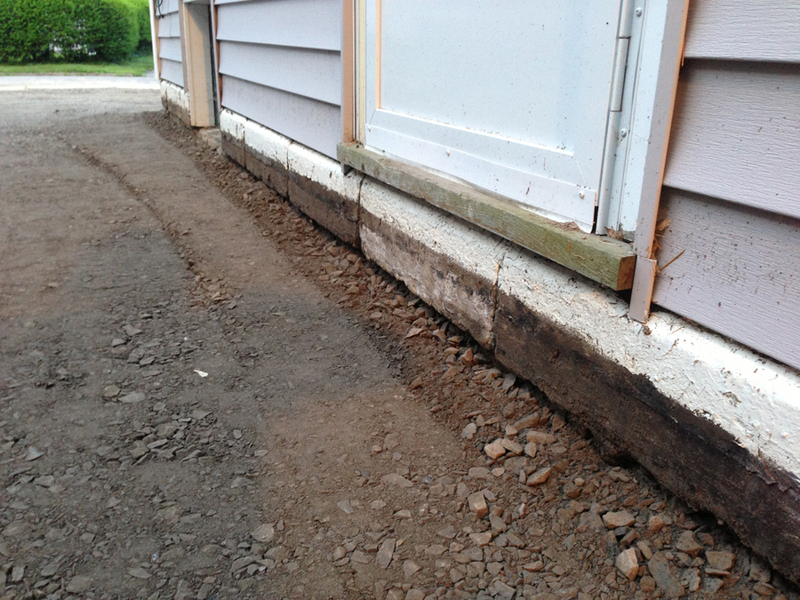 Check out how much was removed, most easily identified by the white paint that was used to freshen up the foundation a few years ago… and the lack of white paint where the foundation used to be covered by driveway layers. This photo was actually taken after they had re-laid and compacted 2″ (or thereabouts) of rock. 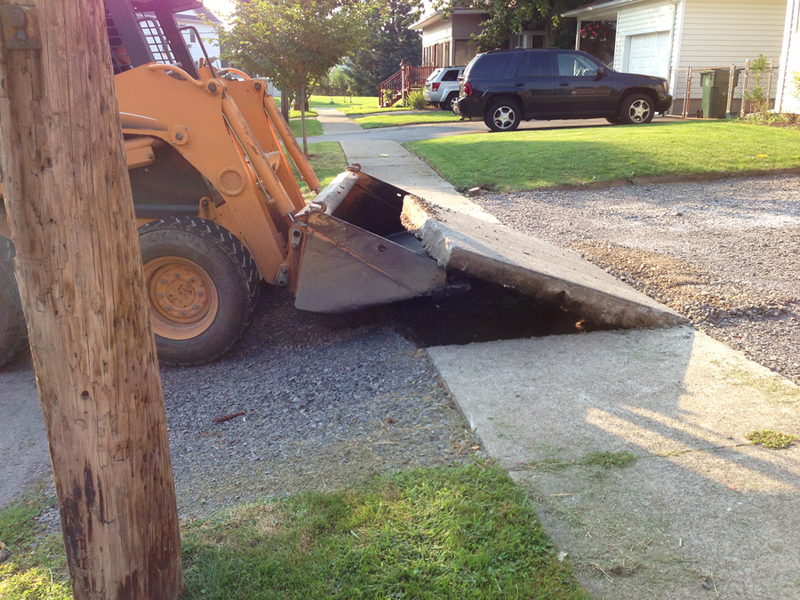 As if the City needed any more evidence that the sidewalks really needed to be replaced, once the excavation was complete, our contractor spent a lot of time obtaining extra permits to completely remove the City sidewalk. 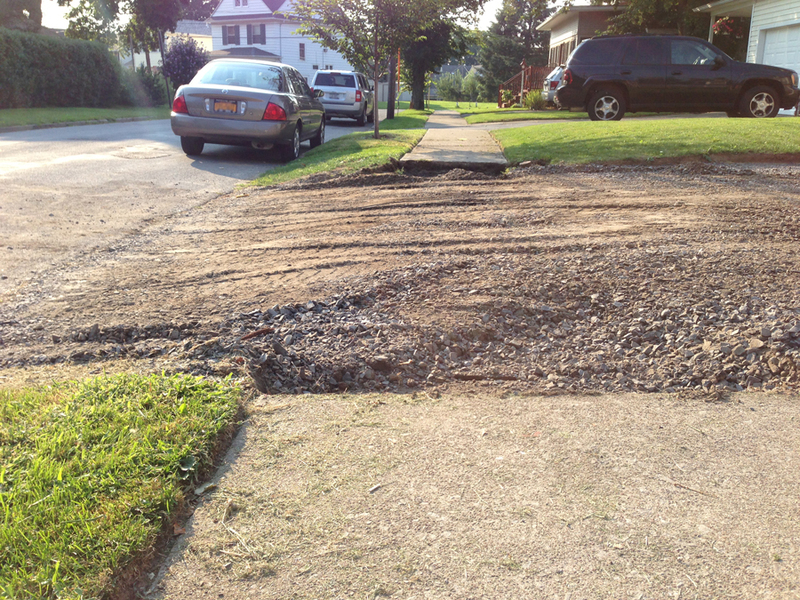 It was not a pleasant surprise to find that the excavation machinery completely pulverized the concrete, allowing our home’s driveway and sidewalk to win the awards for being both the most unsightly and the most treacherous (careful, kids on tricycles and parents with strollers!). In a normal situation, we would have actually been liable for the damage (us! the homeowners!) but because the road had been listed as being in need of repair, our contractor was able to talk them into letting the sidewalk come up completely. The sidewalk wasn’t the only victim – the cement garage floor took a beating from the excavation too. In this case, we were told that it was because the thin concrete had latched onto the asphalt being torn loose, and fractured pieces (pieces the size of dinner plates) with it. 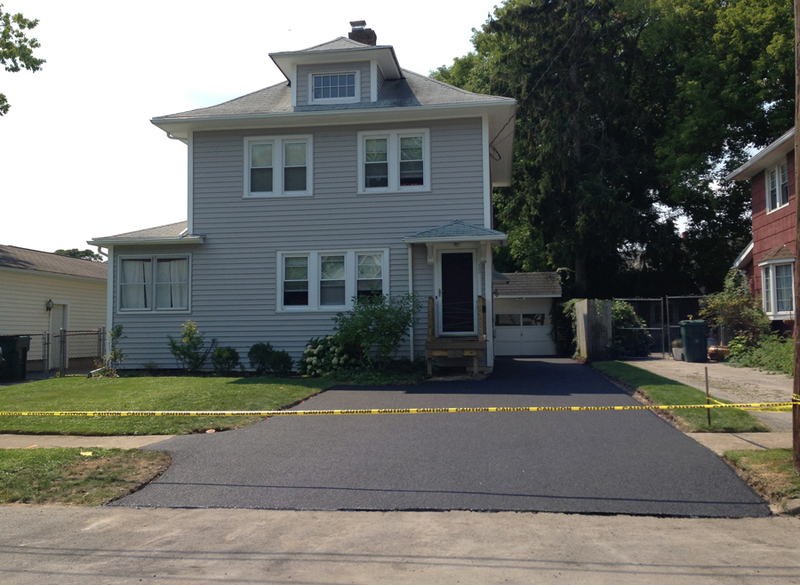 It took another 6 weeks for the permits to be obtained, for the weather to cooperate, and for our schedules to mesh, but the second and final appointment with Pittsford Paving went down yesterday, with a bright and early start time that surely awoke our neighbors. 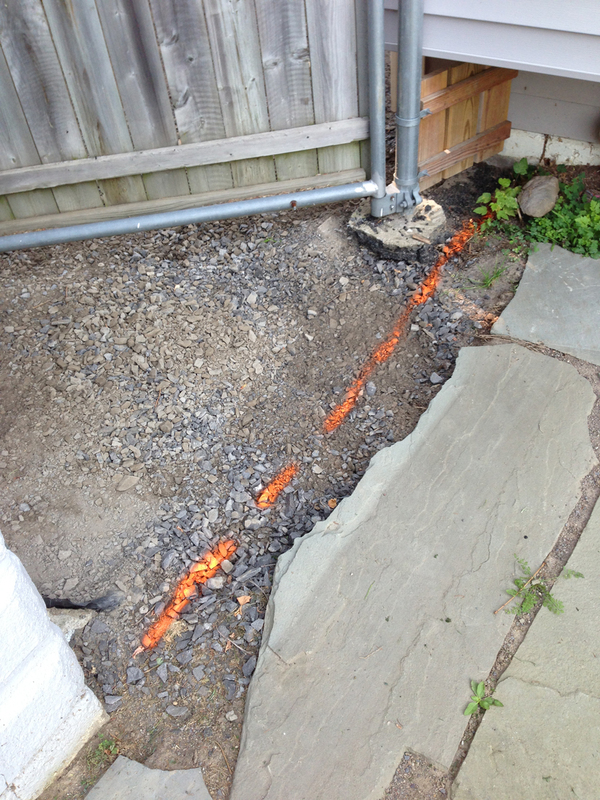 …and used it as an opportunity to further correct the slope into the driveway. It’ll serve as a good guide for when the City updates the street and sidewalk eventually; even though they will have to cut into the asphalt to install it, I hope they can retain the smooth grade. We had to address a few areas before they paved; one, it was decided that the crew would cut 1 foot into the garage floor all the way across to remove the loosened cement chunks, extending the pavement inwards for the sake of convenience. Two, we had to address how the asphalt would meet the existing flagstones in the backyard. While they were previously bordered by the uneven edge of the driveway, the contractor advised doing a straight line and filling in with stone dust for the time being (eventually we’ll probably pull a few smaller pieces of flagstone from the wall surrounding the round patio and secure them into the dust for a finished look). I wasn’t at the house for much of the morning when they got down to paving, but am thrilled with the result. The height of the driveway compared to the old driveway is still much lower–note that you can still easily see the line in the foundation paint, that remaining 6″ will need to be touched up–and at this angle, see the variance in the grass median dividing our driveway from our neighbors? It will have to be regraded, and probably reseeded, as well. The finished surface, so good. Also, the bit about the incline from the street to the old driveway sounds familiar. We have a somewhat steep driveway, and when the city recently repaved our street they took out a small concrete easement at the base (which we were planning to remove/replace anyway). Sadly the new street is so much lower that my car (a Beetle) is not enjoying backing out each morning. Sigh.